It was high tide and the surf was really rough. This driftwood log was trapped in the rip current and refused to beach. Finally as the tide changed direction it managed to stay still for a few seconds at a time but kept moving positions, so I had to keep recomposing. 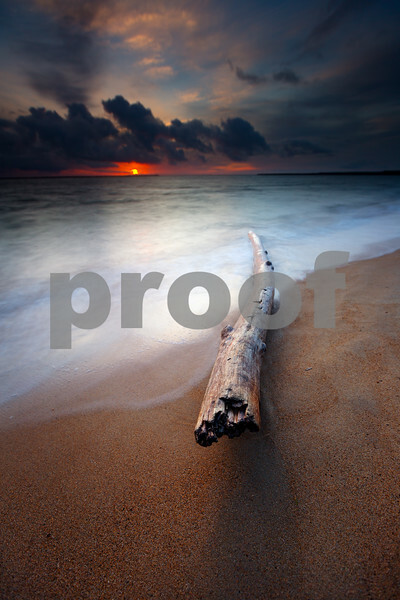 It was actually very frustrating, but I managed to succeed with some sharp driftwood and a decent angle with the sun right on the horizon. I shot at a wide aperture for a more painterly effect in the background and to really pop the wood. This is a 3.2 sec exposure at f/4.5 and 16mm.